"Wouldn't that be great if we could go back home again?" It was 1976, and it was the beginning of the end. It was the third and final season for the Saturday morning series Land of the Lost, and this sloppy 13-episode collection is a sad reminder of what happens when something burns out. First of all, the theme song was changed out of necessity. Gone was Spencer Milligan as dad Rick, a departure that was dealt with in the episode After-Shock, the kickoff of the third season, through the use of the old "door of time" plot device. With Milligan gone, a new "father" figure was brought in, conveniently enough it was Uncle Jack (Ron Harper), who, while on a search mission, plummeted down the same bottomless waterfall that Will (Wesely Eure) and Holly (Kathy Coleman) had two seasons earlier. And to top it off, hairy little monkey-boy Cha-Ka (Philip Paley) was now speaking broken English, and the whole kitchy dynamic and appeal of the first season had become nothing more than a faded memory. The third season offered more of what we had already seen, only less interesting, following the exploits of Will and Holly (and now Uncle Jack) who run around in a mysterious land full of hungry dinosaurs, bug-eyed creatures, and hairy little monkey-boy Cha-Ka It's clear the idea well was running a little dry by the time the this season began, and aside from the usual Sleestak run-ins, there were a number of one-shot appearances by random humans (a hot air balloonist, an Indian, a mysterious Brit), but just like Gilligan's Island, they never help Will, Holly, and Uncle Jack get home. The show was cancelled, so there was no real resolution to having them leave the Land of the Lost, and perhaps if the writers had been given the opportunity to do a proper sendoff then this final season could have been salvaged to a degree. But no such luck, and what's left is a lifeless set of episodes that have to borrow things like Medusa or the Abominable Snowman in order to try and breathe some new life into the show. It didn't really work all that well, and even the introduction of a fire-breathing Dimetrodon just seemed like a hollow reworking of Will and Holly's perennial dino foe, Big Alice. Land of the Lost had just run out of ideas. The good news is that from a campiness standpoint, the show is a laugh riot. Horribly dated effect shots, illogical storylines, and more plot holes than you could count fill every episode. If you can distance yourself from remotely having to take any of this seriously—which shouldn't require too much effort—it is entirely possible that this could be one of the funniest things I've ever seen. Image Transfer Review: As with the other two season sets, all 13 episodes here are presented in their original 1.33:1 aspect ratio. For the most part, the presentation is well within acceptable limits for Saturday morning television fare from the mid-1970s, a bit soft in spots, but generally tolerable. Audio Transfer Review: Audio is offered in an ordinary and serviceable Dolby Digital 2.0 mono mix. No evidence of clipping, and the campy dialogue is always clear. Extras Review: Much like the third season itself, the extras from Rhino for this set are not much to write home about. All the supplements are on the first disc, and consist of a commentary track by Ron Harper on the season opener After-Shock, a short interview with Harper (09m:01s), and a campy clip of Wesley Eure-as-Will crooning (always a "jump the shark" moment) in Will Marshall's Greatest Hit (01m:49s). Harper comes across like an all-around nice guy, and his interview segment is pleasant enough, and on the commentary he still manages to sound like an actor who enjoyed the gig, even if there are quite a few silent gaps in between talking about going to Philip Paley's bar mitzvah. Each episode is cut into five chapters. 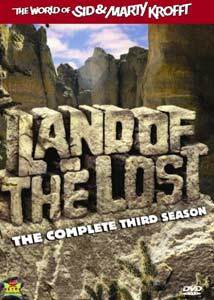 This third season set is really for Land of the Lost completists only, a dismal final collection of episodes that finds the show just going through the motions.